When the black hole is electrically charged, the Schwarzschild solution is no longer valid. Now, we have two separate horizons. When the black hole becomes charged, the event horizon shrinks, and another one appears, near the singularity. The more charged the black hole is, the closer the two horizons are. The photon sphere is always present, but it's not shown on this diagram. The most important consequence of this fact is the following : the exchange between space and time, which arises when you cross the horizon, now appears twice : in the sphere included in the inner horizon (sometimes called the Cauchy horizon), space and time have gone back to their usual roles. So, it's possible to avoid the singularity, which is said to be a temporal one. If the charge of the black hole is high enough, the two horizons disappear : the singularity is naked. Many physicists think that such a situation can't arise- the universe applies a self-censorship. We'll talk further about this fact, in the case of a rotating black hole. A charged black hole is studied like a model, it may not actually exist. The star, which has generated it, is unlikely to be electrically charged. This is the most realistic model, when you remember that the initial star was rotating. Its name comes from the New-Zealand mathematician Roy Kerr, who was the first, in 1963, to succeed in solving the full equations of General Relativity around a rotating massive body. with , are the polar coordinates, if J is the angular momentum and M the mass, a is the rotation parameter J/M. An oblic term appears in which is responsible for the frame dragging effect (Lense-Thirring effect). If a = 0 (no rotation), we find the Schwarzschild metric. So, a strange effect arises from the resolution of these equations : in the neighborhood of such a body, the space-time itself, curved by the mass, is dragged into a rotating movement. Of course, near the Earth, or even near the Sun, this effect is negligible, but near a black hole, it's not the same. 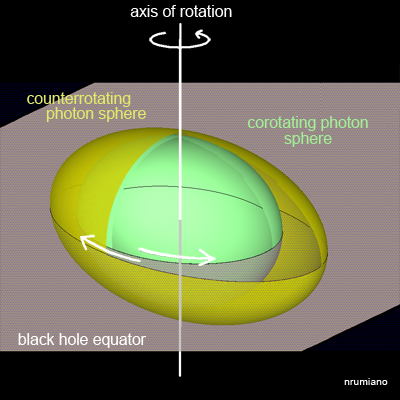 The first surprise, for a virtual observer approaching such a black hole, is the presence of two photons spheres (in the Kerr geometry, what we call a sphere is in fact an ellipsoïd) : depending on whether the photons, in the equatorial plane, are orbiting in the same rotational direction as the black hole or not, they must be on one or another sphere. 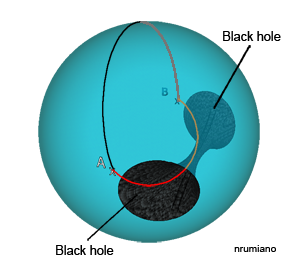 At its poles, the two spheres are joined. (In order to fully understand, don't forget that the space-time itself is dragged by the rotation of the BH). If the rotational plane of the photons is different with respect to the spinning axis, their orbit will be somewhere between the two spheres. Here we have two photon "spheres". The ellipsoïds are flat near the poles and joined together. 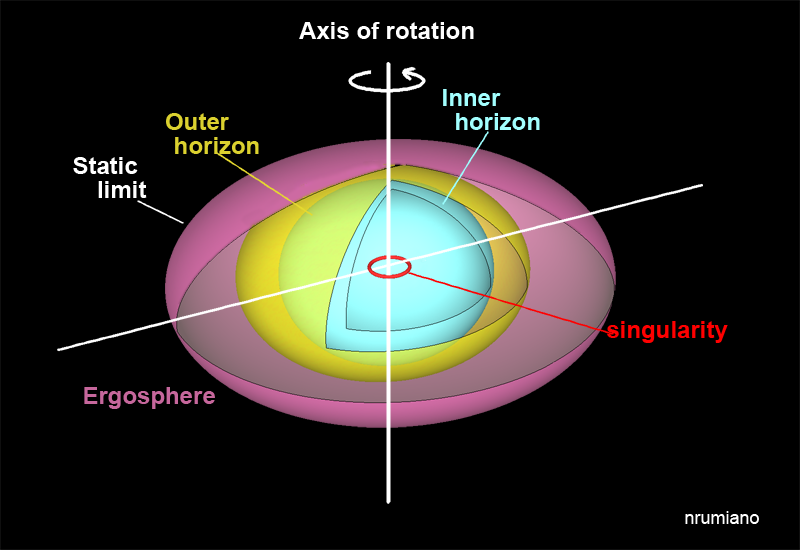 The outer sphere is counterrotating : photons are moving against the rotation of the BH at its equator. The faster the black hole spins, the further apart are the two spheres. Between the two spheres, there is a sea of photons, orbiting around the BH. As he approaches the black hole, our observer enters the ergoshere. This area is defined by the static limit, on the outside, and by the outer horizon on the inside. Inside this area, no stationary frame can exist. Within the ellipsoid of the static limit, nothing, not even light, can stay still, being dragged by space-time in the rotational direction of the BH. The area between the static limit and the outer horizon is called the ergosphere. At the poles of the BH, the static limit joins the outer horizon. The static limit is a boundary. Inside this border, nothing can stay stationary, even if it moves at the speed of light. This limit is the result of the dragging of space-time by the rotation of the BH itself. In a Schwarzschild black hole, the horizon represents the static limit. Once you are inside it, you can only move towards the singularity. You can notice the dependence of the size of the static limit on the angle θ with the equatorial plane. (these formulae are written with G=c=1 according to the usual notation in order to lighten the équations). The two horizons are the same as the horizons of an electrically charged black hole, and produce the same effect : swapping of time and space arises twice, and the singularity is a temporal one, so you can avoid it. The faster the black hole spins, the closer are the two horizons. The singularity itself is ring-shaped. And, except if you approach it on its equatorial plane, it's repulsive. This fact seems amazing, but it's just the result of the equations of Kerr's metrical geometry. So, it's theoretically possible to leave the black hole. But you would arrive either in a so called "negative space" by crossing the singularity, or in another universe. What's the physical meaning of a "negative universe" ? This question has no precise answer at the moment. The Penrose diagram clearly shows that the singularity is a temporal one, and can be avoided. The path, in dark blue, of an observer coming from the past in universe #1 can cross the outer horizon, then the inner one. By avoiding the singularity, he can cross horizons again, and reapper in another universe. Possibly, he can (light blue path) cross the singularity and travel to the "negative universe". By continuing on this journey, it seems possible to go from one universe to another. So, the black hole has created an infinite number of universes. Some physicists think that these other universes are just another area of our one universe (of space and time), which can happen on the assumption that the universe is turned in on itself. Crossing through a black hole (red path) : this is called an Einstein-Rosen bridge (careful : the crossing is through space and time). Gravity in front of the singularity is repulsive. So, there must exist a photon sphere (always an ellipsoid) around the singularity, inside the Cauchy horizon. If you have a look inside the singularity, on the polar axis, you can see the light coming from our universe, the one coming from the negative universe, and the light emitted by the singularity itself. In the area between the two horizons, light will be endlessly blue-shifted, in the same way that outside the outer horizon, it was endlessly red-shifted for the observer : you can consider the gravitational redshift near the horizon to be a transfer of the energy of the photons into a gravitational energy. On the other side of horizon, the opposite transfer takes place. All this is very theoretical. In fact, at the slightest disturbance on the Cauchy horizon it becomes singular (in the mathematical meaning). New physics will have to be invented in order to investigate this situation. All that we have said about a rotating black hole is also true if the BH is electrically charged. We've seen that the faster the BH is rotating, the nearer are the two horizons. If the rotation rate is high enough, the two horizons don't exist, and the singularity is "naked". The cosmic censorship conjecture, expressed by the physicist Roger Penrose, could apply in such a case. The radii of the horizons of the black hole are , if a becomes greater than M, this formula has no meaning. Beyond the event horizon, the singularity is isolated of our universe. If it's naked, this area, which breaks the usual physical rules, is free to interact with the entire universe. A singularity which is not enclosed in an event horizon becomes the past for some points of the space-time. Closed timelike curves are possible, this can lead to a violation of causality. Specifically, an observer, orbiting around it, could travel back in time, and transgress the causality principle. All this is very theoretical, because the Kerr solution is very unstable : it corresponds to a black hole alone in an absolute emptyness. Every addition of matter, even the simple approach af an observer, is enough to destabilize the black hole, and this travel simply becomes unrealistic. If we want to examine further the inside of a black hole, we must use quantum mechanics. It's the only way to investigate the behaviour of the singularity. Quantum mechanics, with the uncertainty principle, prevents the singularity having a null size, and therefore producing an infinite curvature of space-time. The ideal scenario would be, of course, to couple together quantum mechanics and general relativity, i.e. to obtain a quantum theory of gravity. We could wonder why all these studies are undertaken about black holes, which are only marginal phenomena ? The only answer is simply because they may be a key to understand the actual nature of our universe, and beyond it of space and time.